Realities360 Conference & Expo is the premier AR/VR event for training and education. Join us on June 25-27, 2019! It's time to move beyond the hype and unleash AR and VR’s potential for training and education. 2019 Realities360 Conference & Expo is the event for those looking to build, buy, and apply augmented and virtual realities in their work. A brand-new Expo. This is your one-stop shop to find the products, services, and partners you need to support your AR/VR strategy. 50+ sessions showcasing how organizations are actively leveraging XR technologies, giving you real-world solutions and strategies. Optional pre-conference workshops that will give you a full day to build your skill set and incorporate specific tools into your work. 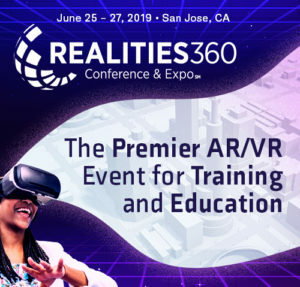 We have an amazing program lined up for you and we look forward to seeing you in the heart of Silicon Valley for the premier AR/VR event for training and education.